The menopause does not just affect the person going through it. It impacts on families and workplaces too - . There are many things a 29-year-old woman doesn’t want to hear. ‘Would you like me to park for you’ and ‘I think it’s a grey hair,’ are just two. As is ‘you are is menopausal’. About 5% of women experience early menopause (before the age of 45) and those words can be hard to come to terms with. I know, because they were said to me – rather matter-of-factly after I was treated for endometriosis and put on medication designed to reset my reproductive system by first placing it in a menopausal state. Endometriosis is a painful disorder in which tissue that normally lines the inside of the uterus — the endometrium — grows outside the womb and can attach to ovaries and other organs causing scarring, cysts and discomfort. I was diagnosed aged 24 and had my first laparoscopy at 25, which is a surgical procedure to cut away patches of endometriosis tissue. The pain and discomfort continued, however, and at 29 I was offered a hormone treatment delivered via a nasal spray. I was told this would cause my periods to stop for a while, give me some relief from the pain and hopefully reset my body. I was up for trying anything, so I agreed. I started to feel the effects almost immediately. I developed hot flushes, particularly at night which interrupted my sleep, and I became quite forgetful and clumsy. I also experienced mood swings and was quick to lose my temper, which was not great considering at the time I was running a business called Laughology! Although I had been warned of some side effects, it was not explained properly and when I went back to my doctor, she told me that the treatment was designed to put me into a menopausal state. Up to that point, my experience of the menopause had not been great. My mum went through it when I was in my teens, and the mix of teen hormones and menopausal mood swings put a strain on our relationship. The support my mum had was little to none, as was the support and information I had. And when I spoke to my sister years later, I realised she went through a similar experience as she too had endometriosis and was put on the same medication with little information or support. My chemical menopause lasted a year. The side effects continued for much longer. The good news is I came out of it eventually and I now understand I was lucky, as my experience of the condition was temporary (and in a funny way it gave me an indication of what to expect in the future). Almost a decade later, when Laughology was approached by to run sessions on menopause awareness, I realised what a much-needed and useful opportunity it would be. The menopause does not just affect the person going through it. It impacts on families and workplaces too. And even though in the last 30 years the proportion of women aged 50 to 64 with jobs has risen by over 50 percent to over 3.5m, many women are just left to get on with it and too often it is a subject that is swept under the carpet. 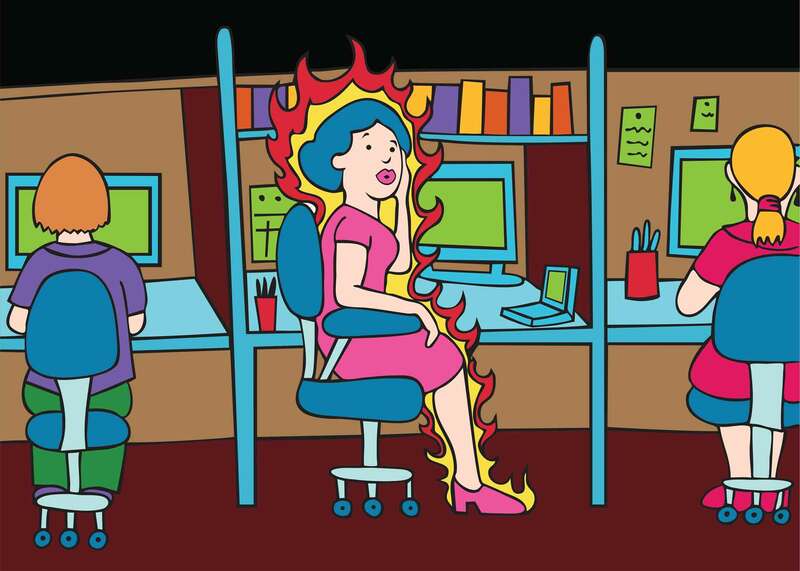 In a recent survey, 50% of menopausal women reported finding work somewhat or fairly difficult due to their symptoms while around 10% of women gave up work all together as a result of their symptoms. But increasingly people will be working later in life, so it makes sound economic and social sense to start helping women, rather than burying heads in the sand. I believe there is a lot more we can do to help people stay in work, to improve wellbeing and welfare and to help families and colleagues, which will all ultimately save services and workplaces money. Have a supply of fresh, cool water to hand. Keep a routine. I found that even when I'd had a difficult night keeping my routine and going to the gym in the morning helped, even if it was just for a swim. I was more likely to sleep the following night. Fill a hot water bottle with iced water and putting that in your bed. Keep a cool, damp flannel by the side of your bed too and sleep with light sheets on and a window open. For me personally, diet made a big impact on my endometriosis as well as my overall wellbeing. This isn't for everyone but eating healthy and cutting down alcohol will help. Make sure you have a healthy and full breakfast. A good breakfast helps your brain and metabolism stay healthy - keeping you as alert as you can be. It also helps build your serotonin levels that drop through lack of sleep. Find things to laugh at and enjoy. Fun and laughter replenish endorphins and serotonin. Speak to your doctor. Many women swear by HRT. Everyone is different, and some people may prefer herbal remedies, but exploring everything with your doctor is helpful. Stephanie Davies grew up on the Isle of Man where she developed a belief in fairies which exists to this day. She has the smallest little fingers of any human being, ever, and can often be seen walking a cat on a lead in the Surrey village where she lives.